On Tuesday, August 28, 2018, at 11:08 AM, Corcoran officers were dispatched to the Corcoran High School to speak with a female juvenile. The juvenile told officers a suspicious male adult contacted her on four separate occasions while walking to school. The juvenile stated she was afraid of the subject and, due to his behavior, she began taking an alternate route to school. The juvenile gave officers a description of the subject and the areas where she was contacted. 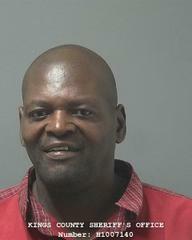 Through their investigation, officers identified the subject as Darrell Knox. The officers also discovered Knox is currently on Parole. The juvenile positively identified Knox as the subject who had been contacting her while walking to school. Knox was contacted and arrested at his residence in the 1300 block of Gaggos Court. He was booked at the Corcoran Police Department for the charge of annoying or molesting a child. A Parole hold was also issued. Knox was later transported to the Kings County Jail, where he is being held on a no bail parole hold. The Corcoran Police Department would like to remind everyone if you see suspicious activity call 559-992-5151. You may also remain anonymous and call the confidential tip line at 559-992-3591.